A few months ago, we posted a video on the blog about mental illness in pets. We briefly mentioned obsessive behaviors. Obsessive Compulsive Disorder (OCD) is a complex disorder in which pets excessively repeat otherwise normal animal behaviors that they (and often, their owners) having difficulty stopping. OCD can resemble other diseases, such as epilepsy, dermatologic conditions, and digestive issues. Since there is no single test for OCD, diagnosis is made by behavior history, observation of behaviors (either directly or by video), and ruling out other medical conditions. Early diagnosis and treatment are critical because the more the dog has a chance to practice his OCD behaviors, the harder it is to extinguish them. We love to hear your success stories. 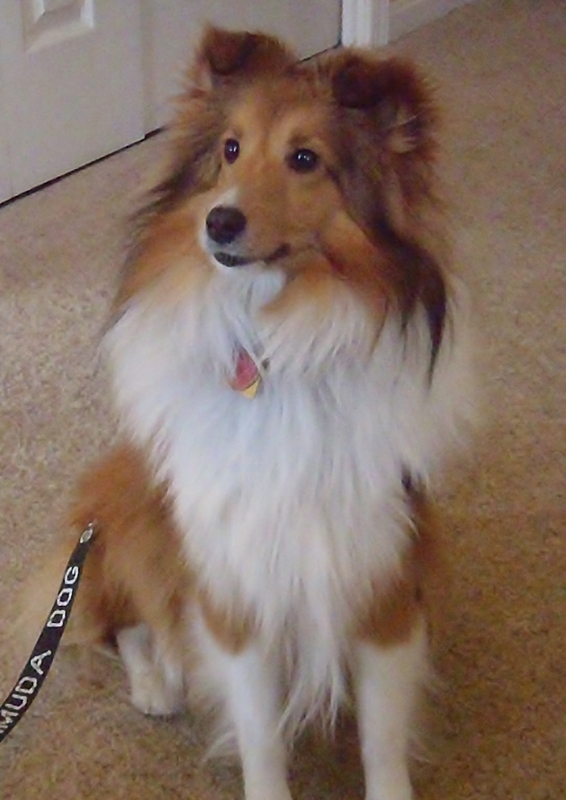 One of our long-time clients has raised and trained Shetland sheepdogs for many years. Their most recent addition, Asta, developed OCD behaviors as a puppy. Through diligent behavior modification and medical management, Asta is on the road to recovery. We would like to share her story through this video made by Asta’s loving and dedicated owners. She put together the video to show Dr. Overall, Pat Miller, and Dr. Karen Hoffmann the difference that they were making in Asta’s life and to thank them for all of their help. Dr. Hoffmann wanted to share Asta’s story in hopes of informing pet owners about OCD in dogs and to show that there is hope. As you watch Asta’s Story, keep in mind that these changes did not happen on their own. It took many months of hard work with behavior modification, medication and management to get Asta where she is now. Asta’s owners, Susan and Ken, worked closely with Dr. Karen Overall, board-certified veterinary behaviorist, Pat Miller, certified dog trainer and behavior consultant and Dr. Karen Hoffmann, Asta’s primary care veterinarian to optimize Asta’s treatment plan. And the work is ongoing, but the rewards are great. Asta’s story is heart-warming and has a wonderful outcome. Not all dogs are lucky enough to have their disease recognized or to have such dedicated owners willing to put the time, energy and money into diagnosis and treatment. Many dogs will suffer a lifetime with their disease. If you have any concerns that your dog may have OCD, it is a good idea to schedule an exam with your regular veterinarian. They may suggest a consult with a board-certified veterinary behaviorist. These veterinarians have received specialty training in the diagnosis and treatment of OCD and other behavior disorders. They can work with you and your primary care veterinarian to get an accurate diagnosis and develop an appropriate treatment plan to help you and your dog deal with this potentially devastating disease. Many veterinary behaviorists will do in-home assessments and some will do long-distance consults. Be sure to check back for part two of Asta’s story coming soon! The information collected in this www.toptenuniversities.co.uk/ dissertation study were researched utilizing the Mathematical Bundle for the Social Sciences (SPSS) variation 14, a computer method used for mathematical investigation. Thus, information on the thriving tables 1-4’s treatment was accomplished due an application program, to SPSS model 14 for info administration and research. SPSS could deal automatically with complex records, the characteristics of the themes, particularly these first-year pupils of Minglanilla National Science High-School as respondents with this research, are called mean and SD or dimensions (PERCENT), if nothing else is advised. Scholar’s t test was used for comparison of parameters that are constant. Nonparametric McNemar’s exam or Kendallis WATTS test was used to study the change in particular parameters within groupings overtime. Spearman’s relationship coefficient was employed for the connection analyses. SPSS type 14, as precisely found in this treatment of info with regard to the concept “Effectiveness of Organized Macro-skills Growth Lessons in English,” established the degree of language effectiveness, the mean pretest and posttest scores, significant difference inside the mean pretest and posttest scores, imply get posttest scores, including standard deviation, regular error imply and correlations of the macro-abilities including hearing, talking, reading and writing. For that students study, the info compiled in this study were analyzed furthermore utilizing the Statistical Bundle for your Social Sciences (SPSS) edition 14, a PC method useful for statistical investigation. Thus, treating info to the platforms 5-9 that were thriving was accomplished due a software program, to SPSS model 14 for evaluation and knowledge administration. SPSS could offer immediately with complicated files, the faculties of the topics, especially the aforementioned first year learners of Guindaruhan Nationwide High School as participants of this study, are called mean and SD or amounts (PERCENT), if nothing else is advised. Pupil’s ttest was useful for evaluation of variables that are constant. McNemar’s check or Kendall’s N check was used to analyze the change in categorical parameters within groups overtime. The correlation coefficient of Spearman was employed for the link studies. SPSS model 14, as properly utilized in this treatment of info with value for the name “Efficiency of Organized Macro-skills Progress Instructions in English,” decided the amount of vocabulary effectiveness, the mean pretest and posttest scores, significant difference inside the mean pretest and posttest scores, imply get posttest scores, including standard deviation, common error mean and correlations of the macro-skills such as listening, chatting, reading and publishing.